Clashes between Islamic State (IS) militants and the army in Egypt's Sinai Peninsula have left more than 100 dead, the military has said. It said 17 soldiers, including four officers, and more than 100 militants were killed. Some reports, citing local officials, put the army death toll far higher. Near-simultaneous raids were launched on at least five military checkpoints and a police station in and around Sheikh Zuweid on Wednesday morning. The attack was one of the largest co-ordinated assaults yet by IS in Sinai. Eyewitness reported seeing militants roaming the streets of the northern town on Wednesday, clashing with armed forces. An Egyptian military spokesman, Brig-Gen Mohammed Samir, told state TV later that the situation was "100% under control". Jihadists based in the restive region stepped up their attacks after the military overthrew Islamist President Mohammed Morsi in July 2013. At least 600 police and armed forces personnel have since been killed. In a separate development on Wednesday, security officials said nine members of Mr Morsi's now banned Muslim Brotherhood, including former MP Nasr al-Hafi, had been killed in a police raid on a flat in western Cairo. The security situation in Egypt has worsened since the assassination of the public prosecutor, Hisham Barakat, two days ago in the capital. The attack in Sheikh Zuweid is one of the biggest of its kind targeting the army in Sinai. Eyewitnesses say IS-affiliated militants are roaming the streets, raising the flags of the extremist group. But it is always hard to verify any story in Sinai. The army has enforced a total media blackout on the area since it intensified its fight against jihadists in 2013. These latest assaults prove that the battle is still far from over. 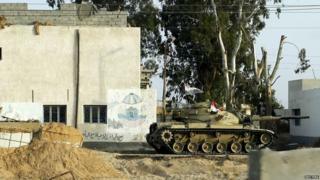 The long military operation, which was meant to restore peace to Sinai has, so far, failed to uproot extremism. President Sisi has vowed to accelerate his crackdown against the "terrorists", a broad term which does not only include extremist fighters in Sinai, but possibly all Islamists. But many are questioning how effective his military solution is. Gen Samir said more than 70 "terrorists" fired mortar rounds and detonated a car bomb in attacks on five checkpoints in the Sheikh Zuweid area of North Sinai province on Wednesday morning. Security and army officials told the Associated Press that at least 50 troops had been killed and 55 wounded, and that several had also been taken captive. Sources meanwhile told the Reuters news agency that at least 36 soldiers, policemen and civilians had been killed along with 38 militants. Dr Osama el-Sayed of El-Arish General Hospital was cited by Reuters as saying 30 bodies had been brought in, "some of whom were wearing army fatigues". Islamic State's local affiliate, Sinai Province, later said in a statement posted online that it had targeted 15 security sites and carried out three suicide attacks. Earlier in the day, officials told AP that dozens of policemen were inside Sheikh Zuweid's main police station, which they said was coming under mortar- and RPG-fire. "We are not allowed to leave our homes. Clashes are ongoing. A short while ago I saw five [Toyota] Landcruisers with masked gunmen waving black flags," Sheikh Zuweid resident Suleiman al-Sayed told Reuters. The militants were also reported to have planted bombs along a road between Sheikh Zuweid and a nearby army camp to prevent reinforcements arriving. North Sinai has been under a state of emergency and a curfew since October, when an attack on a checkpoint in El-Arish left dozens of soldiers dead. Police and army patrols have been increased and additional checkpoints have been set up. In addition, a buffer zone along the border with Gaza has been created by demolishing houses and destroying underground tunnels the military says have been used to smuggle weapons from the Palestinian enclave. Following the deaths in Cairo, the Muslim Brotherhood issued a statement saying that several of its leaders had been "murdered... in cold blood" and urged Egyptians to "rise in revolt" against the actions of the government of President Abdul Fattah al-Sisi. The interior ministry said the men had been fugitive Brotherhood leaders who were meeting to plan "acts of terrorism and sabotage". The Muslim Brotherhood, however, said they were part of its committee supporting the families of detainees and members who had been killed. Analysts said the car bomb attack in Cairo that killed Mr Barakat also bore the hallmarks of Sinai Province, which was known as Ansar Beit al-Maqdis until it pledged allegiance to Islamic State in November and changed its name. In a speech at Mr Barakat's funeral on Tuesday, President Sisi promised legal reforms to ensure death sentences could be enforced more swiftly for those convicted of acts of terrorism. Hours later, a soldier was shot dead outside a museum in southern Cairo and three suspected militants were killed when a car in which they were travelling blew up near a police station in a western suburb.